Increases in demand from students, such as nursing students on placement in NHS organisations, and increases in medical student numbers will have an impact on the workload of LKS, and may require the introduction of new services to support them, such as having access to good WiFi or lockers, and more collaboration with university library services. A move towards more Integrated Care Systems, and potentially more collaborative working under the auspices of Sustainability and Transformation Partnerships (STPs) could have implications for LKS that have SLAs with only some local organisations, and more work may need to be done to encourage organisations that currently don’t contribute to LKS to do so, so that all staff in an area have equitable funded access. LKS are ideally placed to help get better value for the NHS and get the most out of the investment in it by making the evidence base accessible and encouraging its use and application. It could be a good opportunity to promote time saving services such as current awareness and mediated evidence searches. LKS can also support innovation and change through encouraging and supporting knowledge management. There may be a need to help NHS staff become more familiar with digital systems, particularly to help retain staff that are less confident with IT. While some areas are more difficult for LKS to provide training in (such as patient records) there may be areas that we can help with, such as helping staff become familiar with mobile devices and the use of apps. With the focus on preventing illness, LKS will have a role to play in supporting the provision of good-quality health information for patient and carers. Katie Nicholas of Health Education England has prepared a useful summary of references to evidence, knowledge, innovation and Topol in the NHS Long Term Plan. This is the first stage in planning for the next ten years of the NHS in England. Sustainability and Transformation Partnerships (STPs) and Integrated Care Systems (ICSs) will have until the autumn to say how they are going to implement the plan locally. It is said to be ambitious but realistic. This includes taking further action on childhood obesity, increasing funding for children and young people’s mental health, reducing stillbirths and mother and child deaths during birth by 50% and delivering the best treatments available for children with cancer, including CAR-T and proton beam therapy. This includes preventing 150,000 heart attacks, strokes and dementia cases, spending at least £2.3bn more a year on mental health care, delivering community-based physical and mental care for 370,000 people with severe mental illness a year by 2023/24, and saving 55,000 more lives a year by diagnosing more cancers early. This includes increasing funding for primary and community care by at least £4.5bn, bringing together different professionals to coordinate care better, developing more rapid community response teams to prevent unnecessary hospital spells, and speed up discharges home and upgrading NHS staff support to people living in care homes. This includes encouraging more collaboration between GPs, their teams and community services, as ‘primary care networks’, to increase the services they can provide jointly, and increase the focus on NHS organisations working with their local partners, as ‘Integrated Care Systems’, to plan and deliver services which meet the needs of their communities. This will include action on helping people stop smoking, overcome drinking problems and avoid Type 2 diabetes. There are planned thousands more clinical placements for undergraduate nurses, hundreds more medical school places, and more routes into the NHS such as apprenticeships. There will also be work to improve staff retention. Among other plans, there will be a new NHS App, better access to digital tools and patient records for staff. Identifying ways to reduce duplication in how clinical services are delivered, and make better use of the NHS’ combined buying power to get commonly-used products for cheaper, and reduce spend on administration. Making the most of the money: efficiency and the long-term plan. This piece of research is intended to feed into the NHS long-term plan, and was an opportunity for local NHS leaders to say where they think efficiency savings can be made in practice. As such, it reflects some of the initiatives already happening and some possible future ones, but it is not policy as yet and we will need to see which of these ideas makes it into any future NHS plans. Using feedback from Trust leaders, this reports looks at areas where efficiency savings could be made, to contribute to long-term planning for the NHS. The three main areas looked at are cost reductions, productivity improvements, and system efficiencies. Areas of possible cost reductions identified included reducing transactional costs, agency spends, procurement, and collaborative IT purchasing. Rising staff costs due to pay awards was identified as a cost pressure. Productivity improvements included the Getting It Right First Time (GIRFT) programme and use of lean methodologies. System efficiencies were seen as a potentially big contributor to savings, and this might include collaborative or integrated working, admissions reduction, use of technology to redesign pathways, Trust mergers, and new workforce roles. This report is only concerned with the current situation regarding sustainability and transformation partnerships (STPs) and integrated care systems (ICSs), and doesn’t make recommendations. However, it shows that 14 of the 44 STPs have already progressed to become ICSs, and 49% of Trusts agree that ICSs should replace STPs, so it shows that the directions of travel is clearly towards ICSs. MAP has already looked at the implications of ICSs for LKS in a policy briefing on Integrated Care Organisations. Summarises recent developments in system working, including the state of play of STPs and ICSs. It also sets out the background to the focus on collaborative working, and looks at some of the models that are emerging. There is also a look at what factors make collaboration more successful. 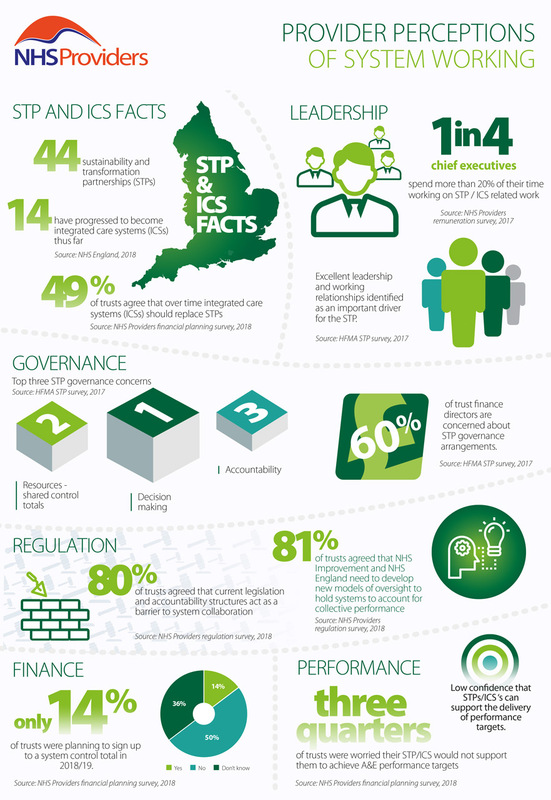 A useful infographic summarises the state of play of STPs and ICSs. Library and knowledge services can support staff and members of the public by signposting to the various reports that informed this document. LKS staff could work with other LKS sectors to signpost to local and national support for bereaved families and carers. Source: NHS England on behalf of the National Quality Board (NQB). The NHS is committed to creating a learning culture and using patient and public experience to drive improvements. The CQC’s report ‘Learning, Candour and Accountability’ concluded that the way trusts engage with families required significant improvement. Personal insights and experiences have shaped the guidance and will benefit all those involved following a death. In particular, supporting staff and families after an unexpected, avoidable or traumatic death in NHS care. It has the potential to break down the ‘them and us’ culture that families and carers have experienced. It is about improving communication and engagement with families and how the NHS learns from its mistakes. It consolidates existing guidance and provides a perspective from family members, who have experienced bereavement within the NHS. It will help trusts and commissioners to identify where they can make improvements in how they engage with families and carers. It is also a source of information for families and carers so they know what to expect following the loss of their loved one while in a trust’s care. This information should supplement organisations own information and resources for bereavement support for families and carers. A policy briefing is available for LKS staff to share in their organisations. Produced by the JET Library at Mid Cheshire Hospitals NHS Foundation Trust. Feel free to reproduce it (with acknowledgement). What does this mean for libraries? With services under great pressure, there is a greater need for library and knowledge services to support effective and efficient healthcare. As well as making health care provision safer, K4H impact case studies demonstrate that LKS can help make cost savings, and can support health service transformation. This is the 26th quarterly report by the King’s Fund, and as well as looking back at what has happened over the past three months, considers the recently announced funding offer for the NHS. The long-term NHS funding settlement, a Green Paper on social-care reform and a 10-year health and care workforce strategy – taken together – might provide the best opportunity in a decade for health and social-care services to both find some stability and use that stability as a base for more fundamental transformation and improvement. The interim report specifically talks about the need for evidence to support the introduction of new healthcare technologies, and library staff can support the accessing and use of the evidence-base, as well as providing support to healthcare staff that wish to publish evidence. There will be an increasing demand for knowledge resources on the topics covered by the review, to support the education of new as well as existing healthcare staff. Some of the technologies are some years away, but there are some such as wearable technologies (for example Fitbits) that are becoming commonplace and there may be an argument for library staff to become familiar with them, or to provide loanable devices so healthcare staff can try them out. Although in most NHS organisations the IT infrastructure is not always conducive to new technologies, where it is, library staff could argue the need to support initiatives such as Skype or other video communications (such as is being done at the Mid-Cheshire Hospitals NHS Trust), or other digital technologies. At the moment, the interim review is seeking evidence to inform the final review, and once this is published the implications for libraries may become clearer but the overall thrust of the review is that new technologies will become more dominant in the NHS, and there is a case for library staff to be given the support to become more tech-savvy so they can support the wider workforce. Summary of driver: This is an interim report of a review commissioned by the Secretary of State for Health and Social Care to look at technological developments and how they impact on the future workforce. In particular, the review will be looking three themes: genomics, digital medicine, and artificial intelligence (AI) and robotics. These are likely to change the roles of healthcare staff, and the report is concerned with the skills required to use these technologies, and which professions will be most impacted by the changes. It is also concerned with the education and training needs of current and future NHS staff. The review proposes three key principles to govern the future workforce strategy. Firstly, patients should be empowered to use new technologies to be more actively involved and engaged in their care. Secondly, the introduction of any new technology needs to be supported by robust evidence. Thirdly, new technologies should free up more time for care and enhance the patient-clinician relationship. Evidence and comments are being sought from those interested in workforce education and development, with a view to informing the Final Report which is planned to be presented in December 2018. Summary of driver: This document illustrates the Government’s approach to address the rise in serious violent crime in the UK. It outlines proposals with education, health, social services, housing, youth services and victim support in order to achieve this. The overarching message in this strategy is that tackling serious violence is not a law enforcement issue alone and it requires cross sector working involving a range of partners. In particular, it needs the support of communities thinking about what they can themselves do to help prevent violent crime happening in the first place and how they can support measures to get young people and young adults involved in positive activities.